Look Out For These Plumbing Problems That Plague Texans - Bosworth Co. Plumbing problems differ across the United States; while Mainers may experience difficulties with freezing pipes, Texans face a slew of other problems unique to the area. Here are some of the most common plumbing difficulties facing Texan homeowners. 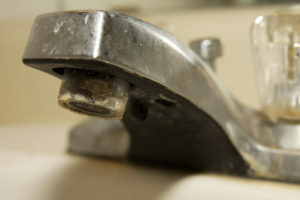 Hard water is great if you want to feel particularly exfoliated after your shower; however, hard water can wreak havoc on your pipes, particularly if you own an older Texas home. Hard water simply means that the water in your pipes has more dissolved minerals and particulates, like magnesium and calcium. If your home is older, this mineral buildup can create blockages, corrode pipes, and settle in your water heater. Even though new tankless water heaters use up to 50% less energy compared to conventional heaters, this buildup in sediment can halve the life of your heater. Luckily, plumbers can implement reverse osmosis and other filtration systems that can help reduce the hardness of your water and improve your plumbing. Not all of Texas is dry. In fact, some areas, like the Sugar Land area, are prone to heavy rains that lead to soil expansion and retraction. These shrink and swell clays can lead to problems in your home’s foundation, slab, and underground plumbing system. Shallow pipes are particularly affected by ground movement, leading to cracks, leaks, or worse. If you suspect an issue with your plumbing or any slab changes after a heavy rain or dry period, don’t hesitate to call professional plumbers in your area. This is a particularly common issue for older homes in Texas. Many old homes utilized galvanized pipes when the house was built, meaning that a steel pipe was installed and covered in a layer of zinc. Unfortunately, the zinc will erode over time and promote corrosion in the pipes. This can cause leaks, burst pipes, and issues with water pressure. If you have galvanized pipes, you’ll likely have to replace your entire plumbing system with the help of a professional plumber. When you want to improve your home’s plumbing, don’t hesitate to call The Bosworth Company in Kerrville. Our professional plumbers offer the best in water filter systems and plumbing repair throughout Texas. Visit our website or call today for more information! Worth The Call. Always.